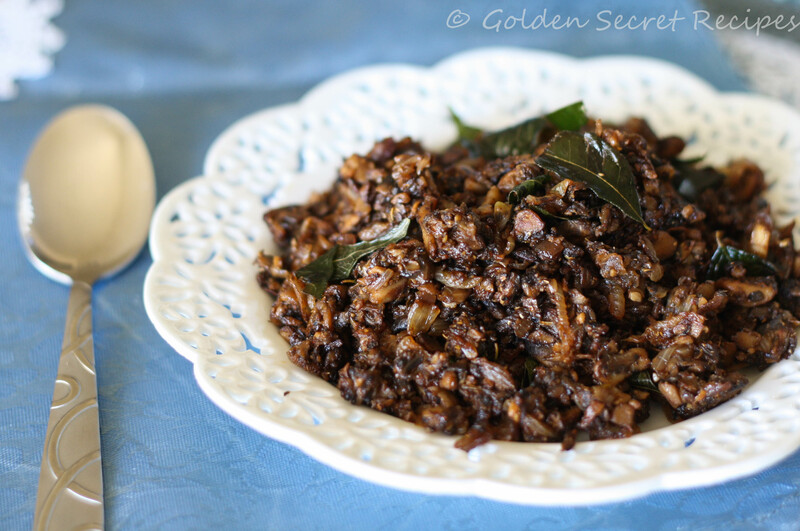 Am back with yet another mushroom recipe. When I posted my Mushroom Shrimp Stir fry recipe, I had couple of my vegetarian friends tell me that I should post something interesting with mushroom but it should be purely ‘Veg’. So I thought, I would post the original recipe from which I borrowed the idea for ‘Mushroom Shrimp Stir fry’. 1. Finely chop washed mushrooms. To this add chopped shallots, chopped onion, curry leaves, red chilli powder, ground black pepper, coriander powder and salt. Give it a good mix and let it marinate for 15 mins. 2. In a pan, heat coconut oil. To this, add minced garlic and sauté till it becomes light brown. 3. To this add the marinated mushroom. 4. Fry this in medium heat till mushrooms cook well. Saute occasionally. It takes about 15-20 mins for the mushrooms and onions to loose its moisture and become nice and crispy. Note: The coriander powder I used is home made. The store bought ones don’t taste as good. So to get the best results of this recipe, please use this simple home made coriander powder. 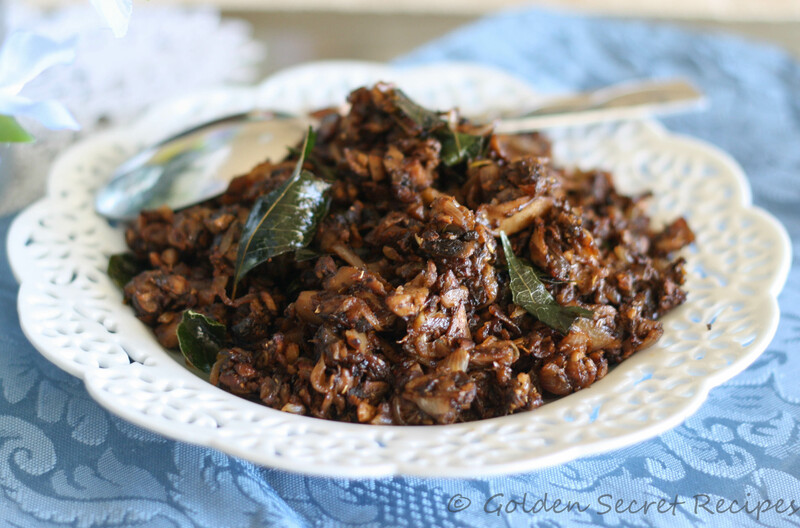 This entry was posted in Dry Varieties 'N' Stir Fries, Quick 'N' Easy Recipes, Specialities-Veggie and tagged kerala recipes, mushroom fry, Mushroom recipes, mushroom with pepper, naadan recipes, palakkadan recipes, Stir fry mushroom. Bookmark the permalink.